Early mobilization (EM) of ICU patients is a physiologically logical intervention to attenuate critical illness-associated muscle weakness. However, its long-term value remains controversial. We performed a detailed analytical review of the literature using multiple relevant key terms in order to provide a comprehensive assessment of current knowledge on EM in critically ill patients. We found that the term EM remains undefined and encompasses a range of heterogeneous interventions that have been used alone or in combination. Nonetheless, several studies suggest that different forms of EM may be both safe and feasible in ICU patients, including those receiving mechanical ventilation. Unfortunately, these studies of EM are mostly single center in design, have limited external validity and have highly variable control treatments. In addition, new technology to facilitate EM such as cycle ergometry, transcutaneous electrical muscle stimulation and video therapy are increasingly being used to achieve such EM despite limited evidence of efficacy. We conclude that although preliminary low-level evidence suggests that EM in the ICU is safe, feasible and may yield clinical benefits, EM is also labor-intensive and requires appropriate staffing models and equipment. More research is thus required to identify current standard practice, optimal EM techniques and appropriate outcome measures before EM can be introduced into the routine care of critically ill patients. During critical illness, patients who are immobilized for more than a few days develop neuromuscular weakness despite receiving full supportive care, which may include physical therapy [1–6]. In patients requiring mechanical ventilation for longer than 7 days, the incidence of ICU-acquired (neuromuscular) weakness is reported to be between 25 and 60% (Table 1) [1, 7, 8]. Such weakness may contribute to increased duration of mechanical ventilation, increased length of stay in the ICU and hospital, and poor quality of life among survivors [9–11]. These data suggest that any interventions which may attenuate such weakness and/or shorten the duration of recovery have the potential to improve both the quality of life of patients and reduce healthcare costs. Early mobilization (EM) may represent one such intervention. In general terms, EM of ICU patients includes the application of traditional modes of physical therapy at an earlier stage than and delivered more regularly than conventional practice, and/or the early use of novel mobilization techniques (for example, cycle ergometry, transcutaneous electrical muscle stimulation). EM appears physiologically logical in patients who would otherwise remain almost immobile, and may also be a safe and feasible process. More importantly, EM may also improve functional recovery, reduce the ICU length of stay, decrease readmissions to the ICU and even improve survival [12–16]. Yet limited systematic attention and analysis has so far been applied to the understanding and assessment of EM . In this article we aim to define the concept of EM in comparison with traditional physical therapy, to review the evidence for its feasibility, safety and possible efficacy, and to define the research agenda for its more comprehensive assessment. There are international guidelines on the traditional approach to physical therapy for patients in the ICU. They include the application of a passive range of movements and the encouragement of an active range of movements early in the ICU stay . Attempts at full active mobilization are often reserved until after the acute phase of the illness has resolved. In particular, it is recognized that rehabilitation may not commence until after ICU discharge, as the patients are viewed as too sick to participate whilst receiving mechanical ventilation. These traditional practices are not based on high-quality evidence and are simply derived from expert opinion. Despite such opinions, however, practice and attitudes surrounding physical therapy and mobilization in the ICU show wide variability worldwide , and even within the same country . The evidence to support the use of passive movements as part of a program of early mobilization is weak . Such evidence suggests that passive movements may prevent protein degradation, maintain muscle mass and alter the inflammatory profile in humans [21, 22]. For example, in 20 subjects with severe sepsis or septic shock randomized to 30 minutes of predominantly passive exercise or no intervention, the passive exercise group preserved fat-free mass, decreased IL-6 and increased IL-10 levels compared with control patients who lost 7.2% of fat free mass in the first 7 days following admission to the ICU . Clearly this level of evidence is minimal and requires further investigation. Clinical observation, however, suggests that more than simple passive movement should be done in order to help preserve muscle strength. EM might represent a better approach than traditional delayed passive movements. Before such an intervention can be advocated, however, it needs to be defined. EM is the intensification and early application (within the first 2 to 5 days of critical illness) of the physical therapy that is administered to critically ill patients (Table 2). EM may also include additional specific mobilization-enhancing interventions such as active mobilization of patients requiring mechanical ventilation and the use of novel techniques such as cycle ergometry and transcutaneous electrical muscle stimulation (TEMS). In the ICU, EM is applied with the intention of maintaining or restoring musculoskeletal strength and function, thereby potentially improving functional, patient-centered outcomes. A major limitation in the ability to determine the outcomes following EM is the variety of different techniques employed, and the lack of standardization and definition of them across studies (Table 2). HR, heart rate; MOS, marching on the spot; MV, mechanical ventilation; OT, occupational therapy; PROM, passive range of movement; PT, physical therapy; RR, respiratory rate; SBP, systolic blood pressure; SOEOB, sit over edge of bed; SpO2, oxygen saturation measured by pulse oximetry. Two randomized, controlled, clinical trials [12, 24] and several observational studies [4, 25–31] provide data on the feasibility and safety of EM as well as preliminary data on its efficacy in patients dependent on ventilatory support (Table 2). For instance, in an observational study, Bailey and colleagues described 1,449 EM interventions in 103 patients . Overall, 53% of these interventions included ambulating patients that were dependent on positive pressure ventilation via an endotracheal tube or tracheostomy. Only 1% of these EM activities were associated with an adverse event. These events included five episodes of the patient falling to their knees without injury, three episodes of hypotension to a systolic blood pressure <90 mmHg, one case of increase in systolic blood pressure to >200 mmHg, three episodes of oxygen saturation decreases to <80% and the removal of one enteral feeding tube. This type of EM treatment was resourced from within the existing ICU staff structure, including ICU nurses, technicians, physical therapists and respiratory therapists. In a further study, the same group described a before-and-after cohort study in 104 patients with respiratory failure who were transferred from another ICU to their respiratory ICU . Transfer to the EM-based respiratory ICU increased the probability of ambulation (P <0.0001) during the patient's ICU stay. By multivariate logistic regression analysis, independent predictors of increased ambulation were transfer to the respiratory ICU with a commitment to EM, female gender, absence of sedatives and lower Acute Physiology and Chronic Health Evaluation II scores. Eighty-eight percent of patients survived to hospital discharge with a mean ambulated distance in the ICU of 200 feet. In addition to the above work, Schweickert and colleagues completed a prospective, outcome assessor-blinded, randomized trial of EM and occupational therapy in two centers in the USA . In this study, patients who were mechanically ventilated for <72 hours and expected to stay ventilated in the next 24 hours were randomized either to an EM protocol (rapid progression from passive range of movements to active range of movements, to bed mobility, to sitting balance, to standing, to standing transfers and gait re-education during sedation interruption) or to a control group, which underwent physical and occupational therapy as prescribed by standard care, typically only after extubation. This trial found that EM was safe and feasible and that it was associated with improved functional outcomes as measured using the Katz Index  and independent walking at hospital discharge. Importantly, patients in the EM intervention group started physical therapy earlier (1.5 days vs. 7.3 days, P = 0.0001) and were significantly more likely to return to functional independence (defined as being able to wash, dress, groom, eat, transfer from bed to chair and walk independently) at hospital discharge (59% vs. 35%, P = 0.02). This study differed from other trials because patients were mobilized very early (day 1.5on average) and the results documented functional outcomes in a blinded manner. Major adverse events were rare (one in 498 EM-related events, with no extubations, falls or change in systolic blood pressure and one episode of decreased oxygen saturation <80%). However, in order to maximize the degree of mobilization, new techniques are rapidly emerging that can be more easily and perhaps more safely applied to ventilated supine patients. A cycle ergometer is a stationary cycle with an automatic mechanism that can alter the amount of work performed by the patient. The cycle can be used passively (no work from the patient) or actively (Figure 1). Cycle ergometry has been tested in healthy subjects as part of the space research program and has been found to preserve thigh muscle thickness during prolonged immobilization . The method has also been shown to be safe and feasible in studies during hemodialysis  and in patients with chronic obstructive pulmonary disease . 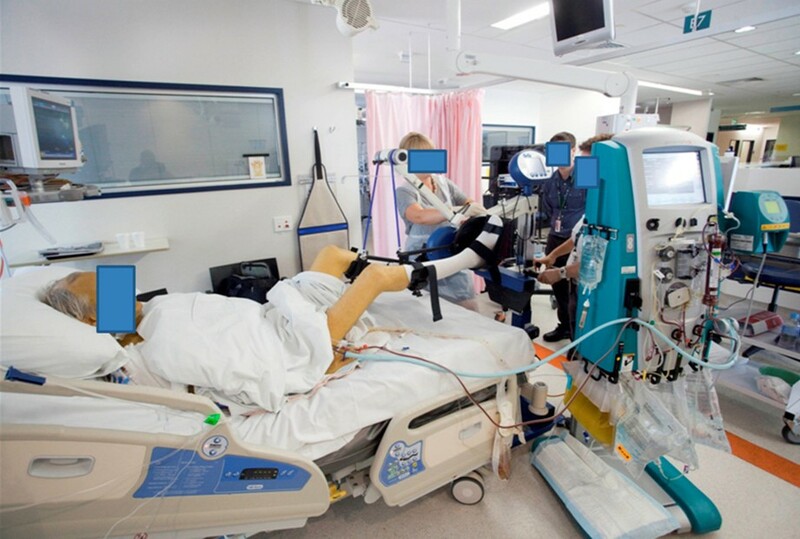 A ventilated patient using a cycle ergometer in the ICU. Cycle ergometer-based mobilization in addition to standard care has now been used as a form of EM in a single-center randomized trial of 90 critically ill patients, and compared with standard care alone. In this study, cycle ergometer-based mobilization improved the median 6-minute walk distance at hospital discharge (196 m vs. 143 m, P <0.05) . In addition, the mobilization method was reported to be safe and feasible, with a median of four cycle sessions completed per week and the time taken from ergometer set-up to clean-up inclusive reported at 30 to 40 minutes. There were no major adverse events and only 4% of cycle sessions were stopped early due to adverse changes in oxygen saturation <90%. TEMS has been used to preserve muscle mass and strength in patients with chronic heart failure [36, 37] and in patients with chronic obstructive pulmonary disease . In a recent systematic review, TEMS was found to improve muscle strength, exercise capacity and disease-specific health status . TEMS is of particular interest in the ICU setting because the loss of muscle mass is rapid and more severe than in other chronic conditions . In addition, the TEMS technique can be used easily in immobile sedated patients. Despite the physiological attractiveness and promise of TEMS, the randomized controlled trials that have evaluated the effects of EM by means of TEMS initiated in the first 7 days of ICU stay have reported conflicting results [41–45]. Differences in patient selection, the inclusion or exclusion of patients with sepsis, the application of TEMS to heterogeneous populations, and variable study methodology have all probably contributed to discrepancies in reported outcomes. The largest study of TEMS to date investigated 140 critically ill patients and randomly assigned them to TEMS or standard care . TEMS was conducted daily for 55 minutes to the lower limb (vastus lateralis, vastus medialis and peroneous longus muscles). The primary outcome was ICU-acquired (neuromuscular) weakness diagnosed using the Medical Research Council score (<48/60) by two unblinded independent investigators. The Medical Research Council score was significantly higher in patients in the TEMS group compared with those of the control group (58 (33 to 60) vs. 52 (2 to 60)). However, this study has been criticized for several reasons . First, measurement of the primary outcome could only be performed in awake, cooperative patients. This limitation excluded 39 patients who died and 44 patients who were cognitively impaired from the final analysis. Accordingly, the intention-to-treat principle was violated. In the intervention group, data from three patients were also excluded due to the use of neuromuscular blockers. Finally, TEMS was applied only to the lower limb but the Medical Research Council score reflects upper and lower limb strength. Although it is theoretically possible that TEMS has systemic effects, the change in upper limb strength seems unusual . There was no report of patient tolerance to TEMS. Future studies should include a report of patient discomfort with the use of this technique. Other small randomized controlled trials (n <25 subjects) have evaluated the effects of TEMS in patients who were chronically critically ill and requiring mechanical ventilation for >14 days. Such trials have reported improvements in muscle mass as measured by ultrasound , muscle strength as assessed using manual muscle testing (2.2 ± 1.0 vs. 1.3 ± 0.8, P = 0.02) and function as measured by changes in the number of days required to transfer from bed to chair (11 ± 2 days vs. 14 ± 2 days, P = 0.001) . In this regard, the results of the small study (n = 24) by Zanotti and colleagues are of particular interest because improvements in muscle strength were accompanied by improved function . The intervention protocol, however, included the use of TEMS in conjunction with a program of active limb exercise in ventilator-dependent patients with chronic obstructive pulmonary disease. Their results therefore suggest that TEMS may act synergistically with active exercise and thus should not be used in isolation but should rather be a useful component of a wider-ranging EM protocol aimed at restoring muscle mass in chronically critically ill patients. There was no report of patient tolerance to TEMS. Despite the above reports, the assessment of efficacy in small trials remains difficult and investigators are increasingly focusing on surrogate outcomes that would justify the conduct of larger phase II studies. Among such outcomes, muscle layer thickness and muscle cross-sectional area measured by ultrasound appear to have a relationship with muscle strength [49, 50]. Further research is required to establish whether these outcomes are associated with sustained improvement in function and health-related quality of life and can be reliably used as surrogates for such clinical outcomes. Ambulation is a specific EM technique that is used in the ICU to improve functional recovery [25, 27, 29]. Standard hospital equipment may generally be adequate. When ambulating a mechanically ventilated patient, however, the standard equipment may not maximize safety and effectiveness . For example, some hospitals have had their own engineers design a custom-made walker for ventilated patients that incorporates a walking frame on wheels, an intravenous pole, an oxygen basket and a platform to support a ventilator, all in a single device (Figure 2). This type of equipment may improve the safety of the patient as the nurse and physical therapist have their hands free of equipment and are able to concentrate on the patient's gait, balance and physiological response to exercise, such as their respiratory rate. There is no evidence that patients require electrocardiogram monitoring during early mobilization. Custom-made walker for ventilated patients. 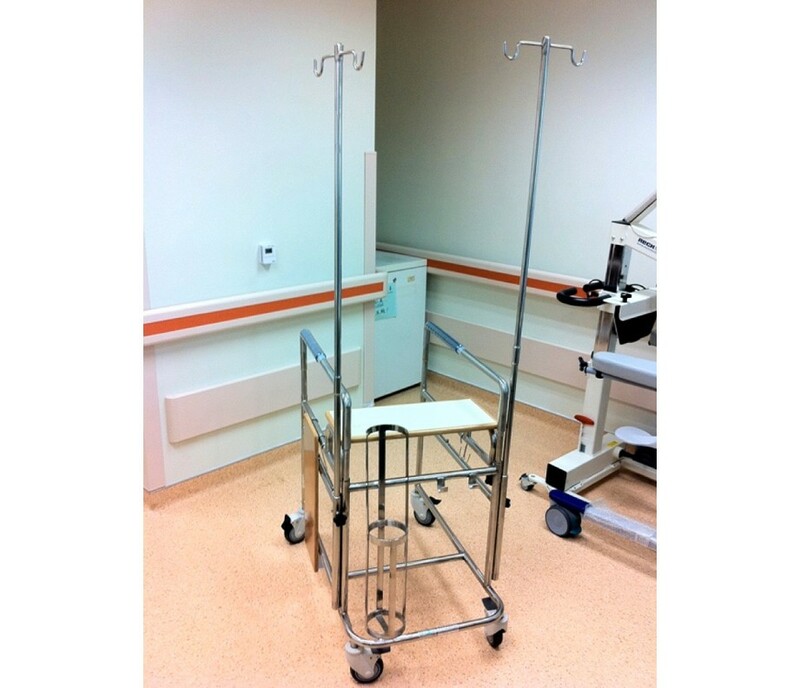 The walker incorporates a walking frame on wheels, intravenous pole, oxygen basket and platform to support a ventilator, all in a single device. Among other descriptive papers of novel techniques for EM in the ICU, the feasibility of Wii and other interactive video therapies has been described. In an observational, single-center study, Kho and colleagues investigated the use of video therapies as a form of EM in critical illness . Of 410 patients receiving physical therapy, 5% used video games for balance (52%) and endurance (45%). The most common games were boxing, bowling and balance board. No adverse events occurred (95% upper confidence limit for safety event rate: 8.4%). No trials, however, have compared such interventions with a control group receiving standard care. Although EM seems intuitively useful and physiologically logical it can in fact be a complex and effort-intensive therapy, which is made even more challenging by the presence of multiple barriers that impede its wider uptake . Such barriers include inadequate staff to deliver physical therapy, lack of equipment, concern regarding patient safety and physiological stability , sedation and ventilation practices, placement of vascular lines, and the paucity of data on efficacy and health-economic evaluation to convince clinicians to apply EM . A key barrier to the delivery of EM is concern about the safety of the patient . Adverse events may include the dislodgement of vascular lines, nasogastric tubes and urinary catheters and, much more importantly, of an artificial airway, leading to life-threatening hypoxia. To counter these concerns, however, there is an emerging body of data suggesting that EM does not impose an increased risk to patients if it is performed with appropriately trained staff [4, 12, 24, 25, 27, 28, 30]. In several studies conducted in US centers, EM involved a mobilization team of three ICU clinicians, including a physical therapist, a nurse and an occupational therapist or an assistant [25, 27, 28]. In addition, patients were carefully evaluated holistically prior to undertaking EM with a comprehensive assessment of age, level of fitness prior to ICU admission, presenting condition, tolerance of other interventions and the amount of ventilatory and cardiac support required prior to EM. EM is feasible only if the patient is awake and cooperative  and therefore the use of sedation needs to be minimized to facilitate EM . The importance of interactions between the degree of sedation and the ability to apply EM has been highlighted in several publications [30, 53]. Other key factors that appear to be associated with successful EM include adequate pain management and early recognition and management of delirium [13, 54–56]. An additional consideration is the availability of sufficient staff and equipment to facilitate EM. Physical therapists should be an integral part of the interdisciplinary team in the ICU involved in the implementation of EM. Having at least one ICU nurse available is also important (Figure 3). In the USA, a respiratory therapist would also be included to disconnect the ventilator and assist with a portable ventilator . The need for such complex multiskilled personnel with sufficient training in EM and the need for appropriate equipment may be the major barrier to the implementation of EM in most ICUs worldwide. 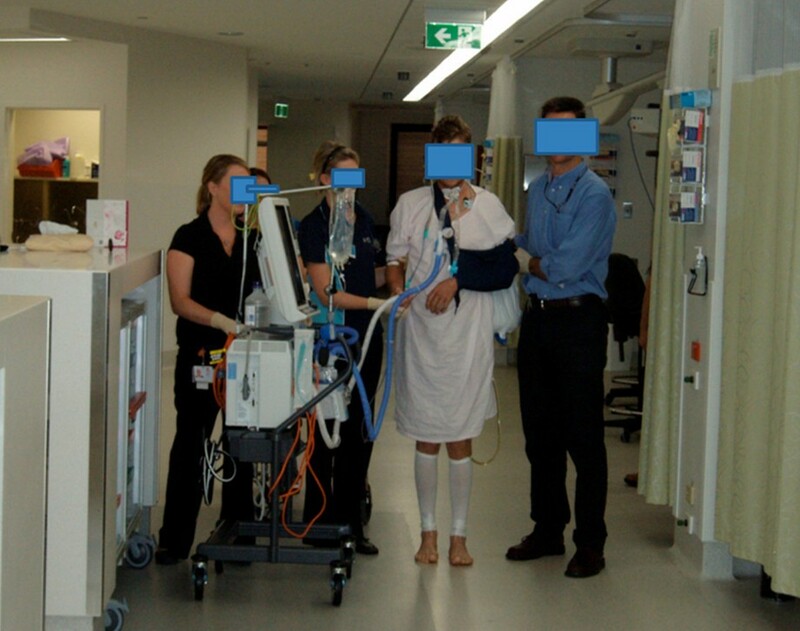 A ventilated patient walking with assistance of physical therapists and a trolley. International differences in staff availability result in heterogeneous research questions in relation to EM in different countries. In American studies, for example, research has concentrated on providing information to justify appropriate resources for physical therapy input in ICUs . In contrast, in Europe and Australia physical therapy is generally considered part of standard management. Two national surveys, however, have reported a striking degree of variability between institutions within the same country in terms of referral to physical therapy during critical illness, staff ratios and frequency of such therapy [19, 20]. This variability in practice underscores the importance of carefully defining and understanding usual care prior to undertaking any interventional studies to evaluate the efficacy and safety of EM in different jurisdictions. The variability also highlights the limited external validity of single-center studies. Standard mobilization practice in ICUs nationally and internationally remains poorly defined. Until standard mobilization is clearly defined and measured in multicenter studies it is impossible to conduct studies of any EM interventions that are relevant to modern ICU treatment, have external validity, and provide sufficient treatment separation. There may be limitations to establishing a true, ethical control group to establish the effect of EM, especially in those countries where physiotherapy practice already includes elements of EM. The typical functional outcomes of candidate patients who survive and are treated with standard care also need to be defined. Once baseline practice and functional outcomes are established in multicenter prospective cohort studies, then multicenter pilot studies of a candidate EM intervention can be tested for separation and contamination. In addition, several potential relevant outcomes (muscle thickness, muscle strength for different muscle groups, functional independence) must also be assessed as outcome measures for EM interventions and their relationships with each other understood in order to power future larger studies of these interventions. ICU survivors recovering from a prolonged illness often have muscle weakness and major functional impairment. Early mobilization is a physiologically logical candidate intervention to attenuate such weakness. Observational studies and initial small randomized trials evaluating EM suggest safety and feasibility. These studies also suggest that EM has the potential to improve functional outcomes in survivors. Unfortunately, such studies are mostly single center in design and carry limited external validity. Further trials to investigate the potential benefits of EM and the best techniques to maximize its efficacy are warranted but require careful consideration of standard practice, optimal treatment strategies and outcome measures. Written consent for publication was obtained by the patients.